The Ponderosa Lodge offers 4 rate schedules, depending upon the time of year and type of group: ski season, summer, family reunion, and family camp. Ski season rates — includes lodging, breakfast and dinner. Price is the same regardless of age, except for infants. Summer rate (non-ski season) rates — includes lodging, breakfast, lunch and dinner. Price is the same regardless of age, except for infants. Family reunion rates — includes lodging, breakfast, lunch and dinner. Summer family camp rates — includes 6 nights lodging, 6 breakfasts, 5 lunches and 6 dinners. Typically, family camps arrive for dinner on Sunday and depart after breakfast the following Saturday. 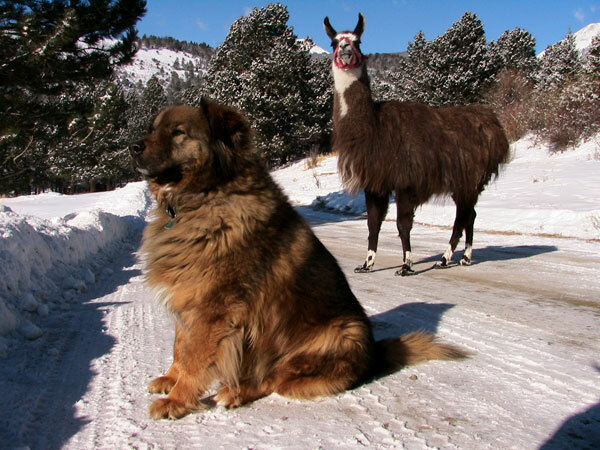 Charlie (left) and Shavano, self-appointed greeters, waiting for someone to drive up the road.